Last summer Brent and I decided it was time for a trip of a lifetime. We traveled to London, England, a city I have adored from my many years of reading Charles Dickens novels. The beauty of the city, the architecture, the history and the velvet green countryside literally took my breathe away. London is one of the most elegant cities in the world. Our return began to unfold a few weeks ago. Brent and I talked one day about serving a mission for our church. I confessed with all of my years into genealogy that I would love to serve a temple mission. Brent asked which temple–I answered,” if life were a dream and I could have my wish, I would choose the London Temple”. We reflected on our two weeks there last year. We loved it, we loved the pace of serving in the temple, making good friends, and seeing the beauties of England when time permitted. Brent suggested I email our friends Ann and Paul, whom we met last year. We knew they were still serving in the London Temple. I sent a simple email with the wish included and sent it off into the cosmos. Ann replied a week later and said that she enjoyed the letter so much she hand carried it to the temple president, President Kenneth Johnson. I thought that unusual, but anyhow, I didn’t think too much of it. While in Dallas visiting with our son Rod and Jen and their family, a trip where Laura, Chandler, and Eden accompanied us, I had a phone call one afternoon from the prefix 11-44. . . and I knew that was either England or Scotland. Thinking it was my best friend from high school Ruthie who lives in Scotland, I answered enthusiastically. Much to my surprise, it was the first counselor in the presidency of the London Temple calling Brent and I on a mission. He encouraged us to come as soon as we could. That is how my dream came true! We are very busy now, excited, hoping to get more organized, and trying to make our deadline and flight on August 10. More to share. . . . 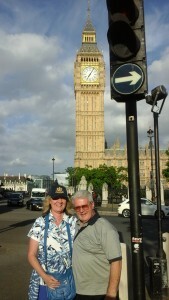 Here we are in front of the famous Big Ben, timepiece for the world.